Beware: Gorehund - "Artists Beware"
UPDATE #2: (DATE: September 22nd, 2016) I messaged both the new owner, and gorehund. the badge was not sent to the the new owner after our second conversation about it being shipped. I messaged gorehund and did not recieve any response even after my mutiple times trying to reach them until days later. Finally after contacting me, I cannot say I have had a worse experience working with someone ever. 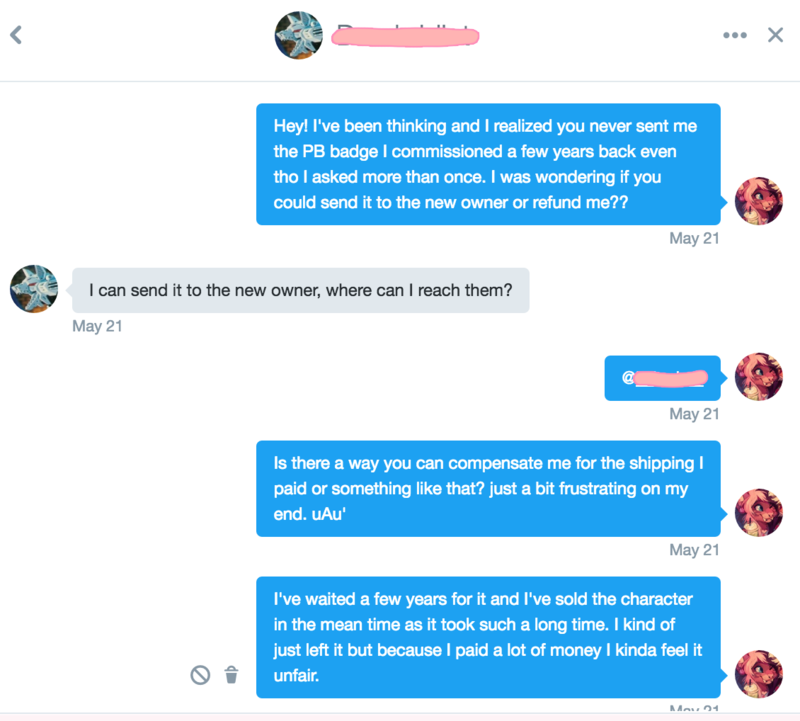 Please do not commission this artist unless you would like to be wait years, and be treated like garbage. WHERE: Commission engagements were taken via FA, and Twitter. 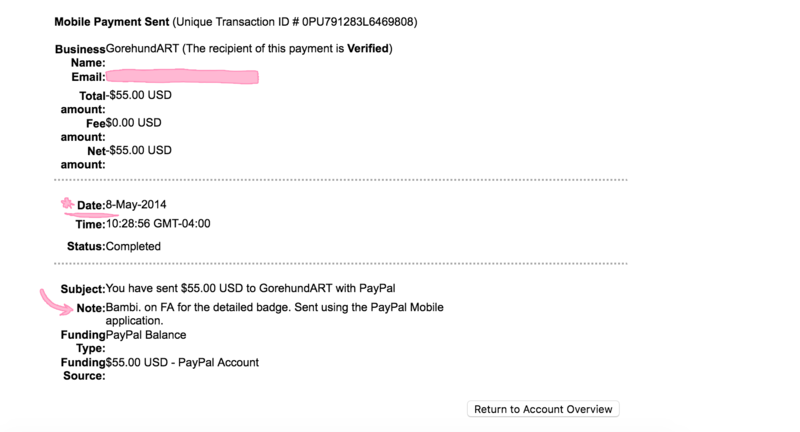 WHEN: Commission was paid May 8th 2014. EXPLAIN: I commissioned Gorehund in 2014 for a badge of my new (at the time) character, PB the saber tooth. I paid $50 for the badge, and shipping. The badge was completed in early July. Everything seemed to be running smoothly. However, I never received the badge. Two years later now, I had sold the character, and suit. 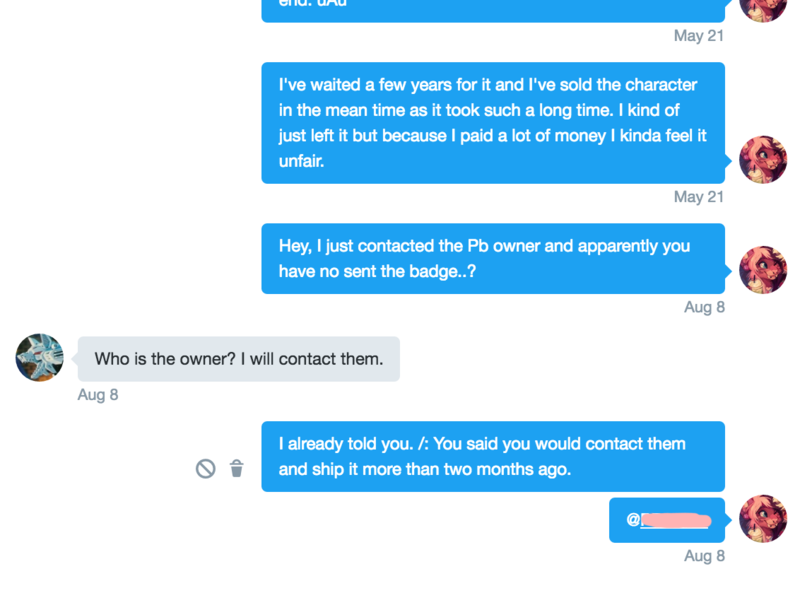 This may (2016) I contacted Gorehund via twitter, mentioning that I never received the badge, and that it would be nice to get a refund, or have the badge sent to the new owner. They replied, asking for a new address to contact the new owner, and the was the end of it. More than two months later, I contact the new owner of PB, and they have not even heard from Gorehund. I immediately contacted gorehund, and they asked where to reach them (though i had already told them in may). This has been one of the worst experiences with an artist I have ever received. All replies to me were cold, and extremely unapologetic. Long story short I have not received what I paid $55usd for in over two years. Yeesh, I would never want to do business with this artist after seeing this behavior. The badge has been completed for two whole YEARS and they can't be bothered to smack a stamp on it and send it through the mail? Beware warranted! Yeah, it was an absolute mess. not to mention their very unforgiving nature after waiting two years. /: if they would have been at least a little nicer I wouldn't have as much of a problem. but they are notorious for this apparently as I have a few friends in the same position. I'm waiting on a badge from them too, from about the same time period. I didn't even know it was finished for a couple months because at the time I didn't use twitter and I didn't know they used it more than FA. Why didn't they just scroll up the DMs on twitter to where you already told them the name of the new owner. :/ And no apology or even acknowledgement over how long they took mailing out the badge? What a rude way to handle a customer you've been shorting for two years. Extremely well-warranted beware. literally. :| like.. if she was at the least nice to me i wouldn't be so ticked off. I honestly don't think any of them had been sent, for sure mine hasn't been. sorry to hear that. ): i'd recommend posting an AB. Sadly it seems like shipping as been a big issue for them for a really long time. :/ And those follow up responses are horrendously rude for how long you waited to get it sent to your address (so saying they offered to send it to you seems kinda laughable at that point?) I don't understand why they are acting so hostile to you and can't seem to muster up a single apology when you're still the actual commissioner. When I bought something from them a few years ago getting ahold of them was extremely difficult for me too. I honestly think the only reason I got mine at all is because I was (politely) upfront about how I would initiate a chargeback to cancel the order if it was not shipped out before my protection expired. Normally I wouldn't be so cautious about it but I had heard stories about shipping issues even back then and didn't want to get burned. I'm surprised they haven't considered just no longer offering shipping as an option if its still such a difficult area of the commission process to keep up on. Disappointing to some sure clients, but it'd be a lot easier than constantly owing people like this. No kidding, you'd think after messing up this bad an apology would be te first thing. I'm not really sure either honestly. you should seriously post an AB, the more ,the better. Since I did get my stuff it'd be nothing to warrant an AB post on my part, but it was definitely uncomfortable having to be prepared to forcefully get my money back because they were notorious even then for shipping issues. Had I not known of the rumors at the time and protected myself like that who knows what would've happened though.